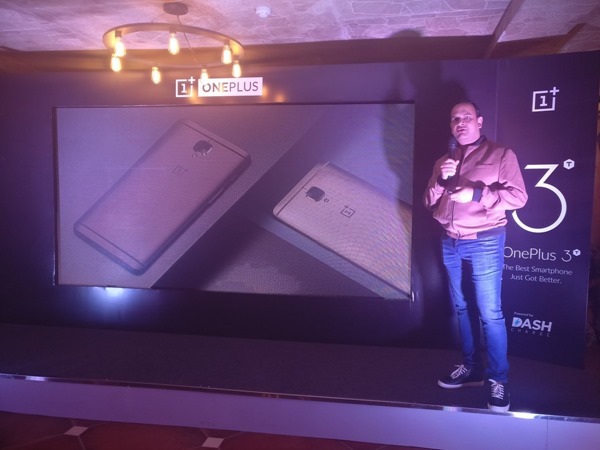 The OnePlus 3T has been launched in India. The launch comes just 3 weeks after the phone was unveiled, on November 15th. The OnePlus 3T offers a moderate upgrade over the OnePlus 3. A 16 megapixel front camera with a Sony IMX298 sensor on the OnePlus 3T, replaces the 8 megapixel on the OnePlus 3. The OnePlus 3T is powered by a Qualcomm Snapdragon 821 processor, whose CPU offers 10% better performance, than the OnePlus 3's Snapdragon 820. Likewise the GPU performance is also 5% better. The OnePlus 3T comes in two storage variants, one with 64GB internal storage and one with 128GB internal storage. It has a slightly bigger battery than then OnePlus 3. The OnePlus 3T has been priced at Rs.29,999 in India, for the 64GB variant. The OnePlus 3T 128GB variant has been priced at Rs. 34,999. The Phones will be sold exclusively via Amazon India, from December 14th. The OnePlus 3T will comes in two colours: Soft Gold and Gunmetal.